We are back with another instalment of our Organization for Your Creative Space. 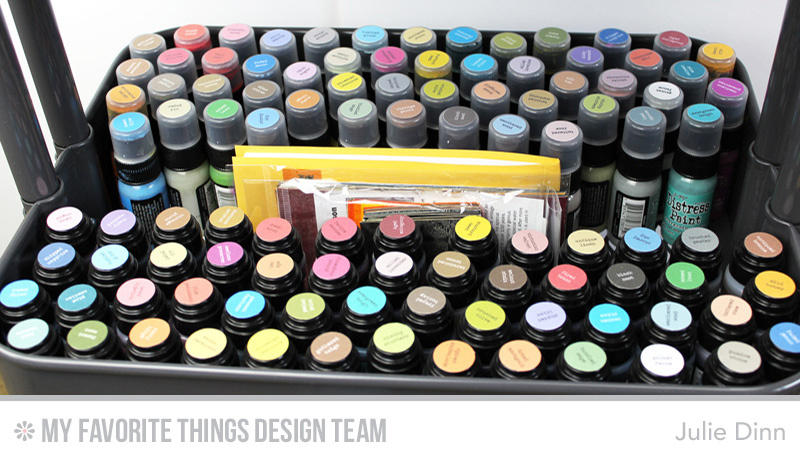 This month the team is tackling their organization and storage for their colouring mediums. Like most of my storage solutions, my Copic storage has changed over the years. For many years I had my Copics in the Copic Wire Racks. Each marker had it's own slot and all the colours where in numerical order separated by colour group. While I liked this storage for the most part, it became tedious to put all the colours back in their designated spot. I also found that the racks took up too much space on my desk. My new solution, these fabulous Marker Nook Units from Stamp N Storage. These units match my ink pad storage. They are the same height as my ink pad holders, so I can configure them in different ways with the ink storage. 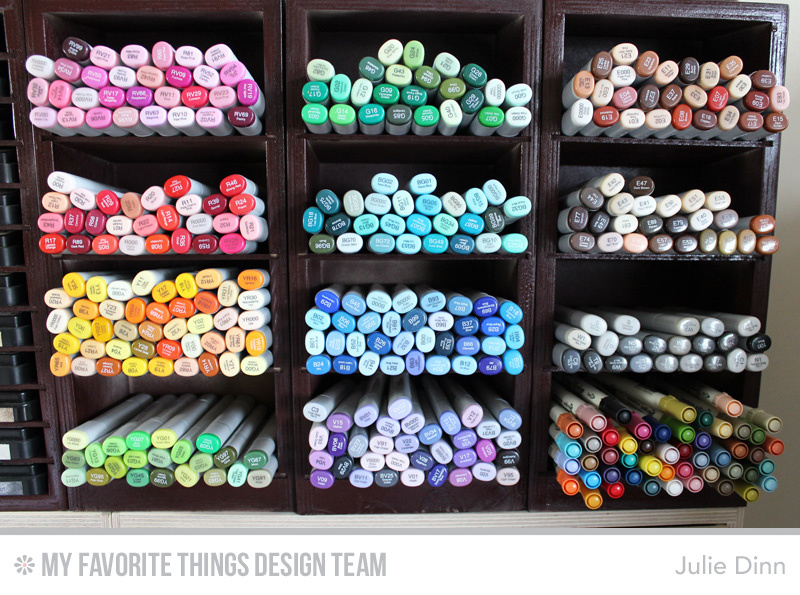 I have over 300 Copic Sketch Markers and they fit nicely in the three units that I have. 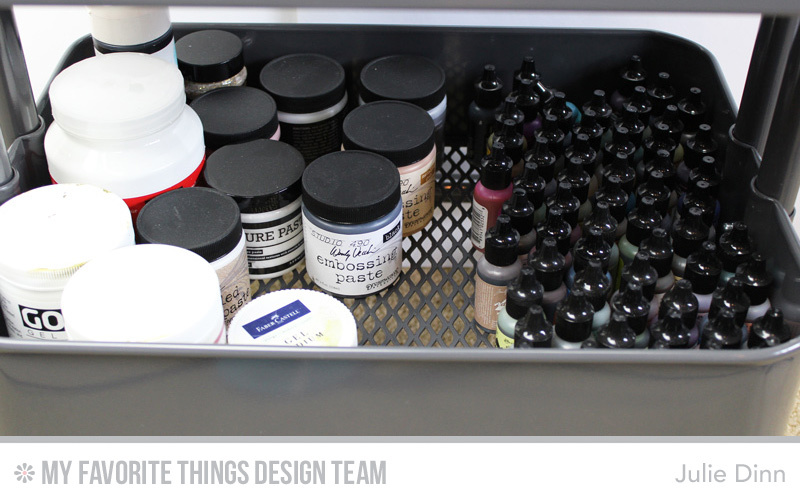 I also keep all my Tim Holtz Distress Markers in one of the cubbies. One of the items that I often use for colouring is my MFT Ink Refills. The Premium Dye Ink Refills are the ones that I reach for most often. 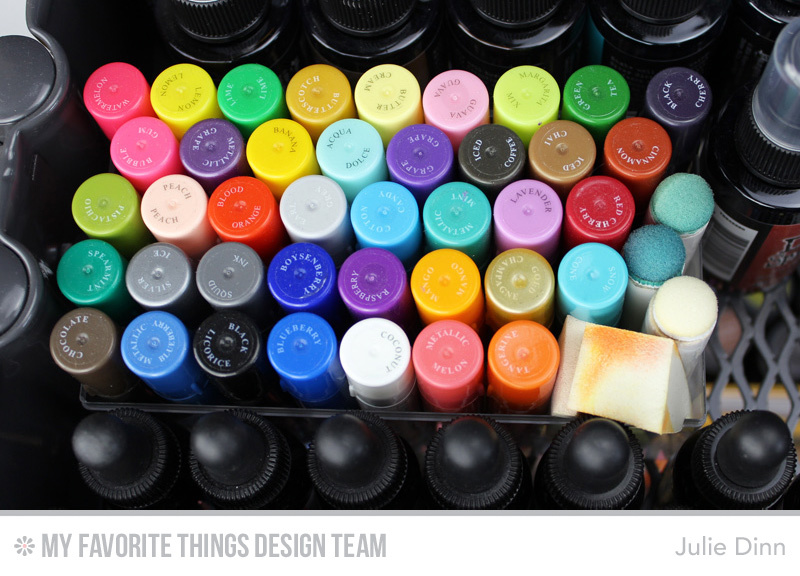 My next picture features my Color Cart. This is the Råskog Cart from Ikea. I seriously cannot tell you just how many items this little cart holds! 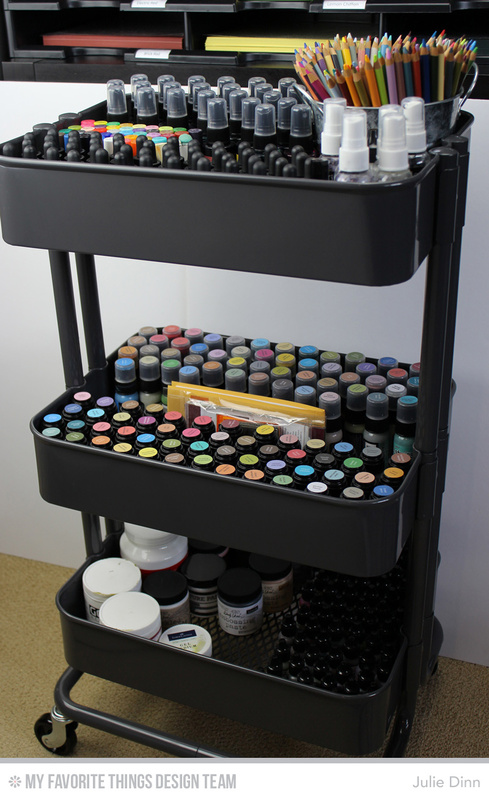 I keep this cart in a large walk in closet, and I roll it over to my desk when I am ready to get all inky! In the far right hand corner, I store my Sheer Shimmer Mist, Steel Shimmer Mist, and Sheer Sparkle Glitter Glaze. I mix the mists with Premium Dye Ink Refills to create gorgeous shimmery colours. I also store a few small jars of Crackle Paint and Glossy Accents. 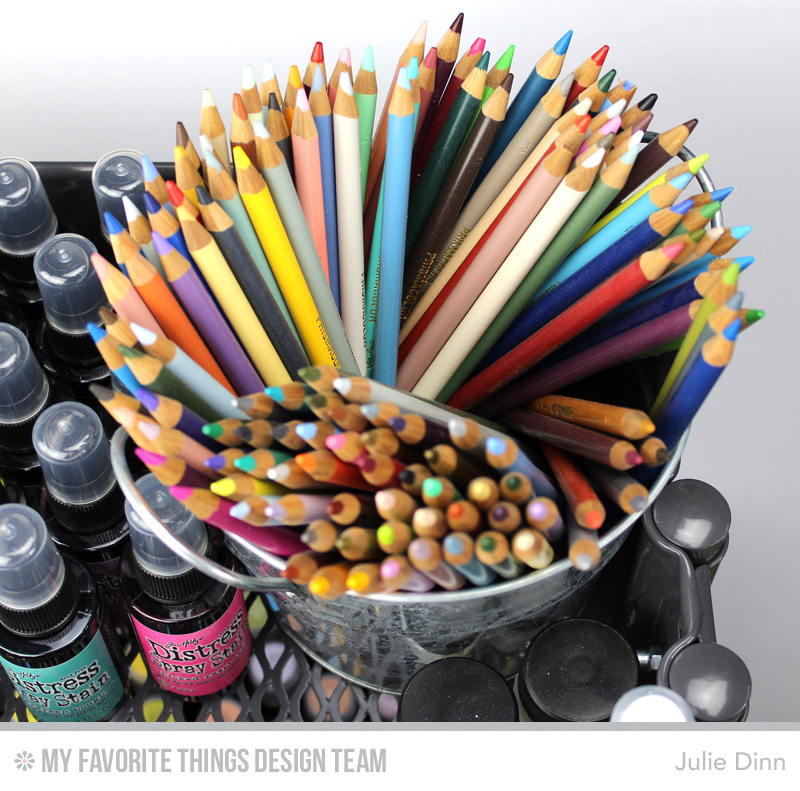 On the top shelf of my cart I have a small planter style tin that holds all my Prismacolor Pencils. There are over 100 pencils in this small tin. 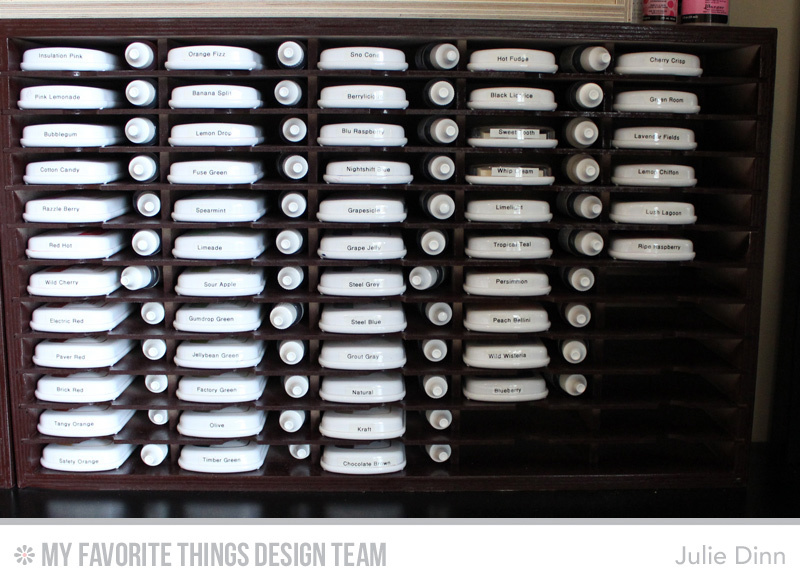 I love storing them this way as I can easily take the tin off the cart and place it on my desk. I picked up a bunch of these tins a few years ago in the craft section of Walmart. On the other side of the top shelf, I have all the Distress Reinkers. I love using these for watercoloring and for different techniques. In between the Distress Sprays and the Distress Ink Refills I have a small plastic container filled with my Gelatos. I see Faber Castell has come out with a few new colors, so I think the sponges will get the boot out of this container. The container is actually a Ferro Roche candy container. These containers are seriously the perfect size for small item storage. In between the inks and sprays, I have my Peerless Water Colors. I really need to take some time to explore some better storage options for these. I have seen people place them in books and I think that might be what I end up doing. I don't use them very often as they aren't very appealing the way they are currently packaged and stored. The left side of the bottom shelf is full of stencil pastes, embossing pastes, and Gesso. The right side of the shelf holds my collection of Adirondack Alcohol Reinkers. I absolutely LOVE this cart and all the goodies it holds. 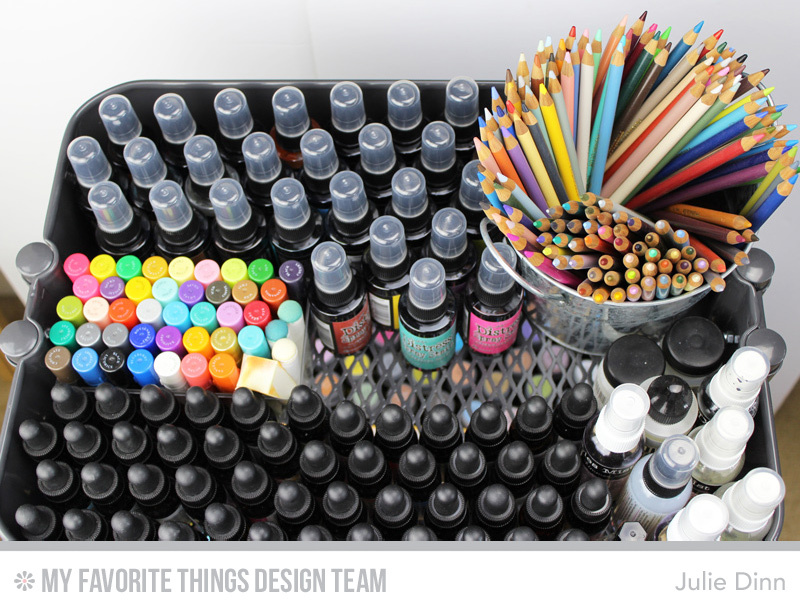 Be sure to check out the MFT Blog to see how the rest of the design team organizes their colouring mediums. I know they all have some fabulous ideas and solutions to share with you! Wow....this cart looks like a rainbow of heaven!!! Love how neat and organized everything is!! Love how organized you are! Oh my heavens, Julie - that cart! I have a couple of the ink holders from Stamp-n-Storage, too -- love them. Do you still use your Adirondack Re-inkers? I have them all but they are sitting dormant. Would love to know what you're doing with yours these days. I know what I will be buying on my next trip to Ikea! Surely hope they are in stock!! Such an awesome space and love how you dressed up your Rascog. 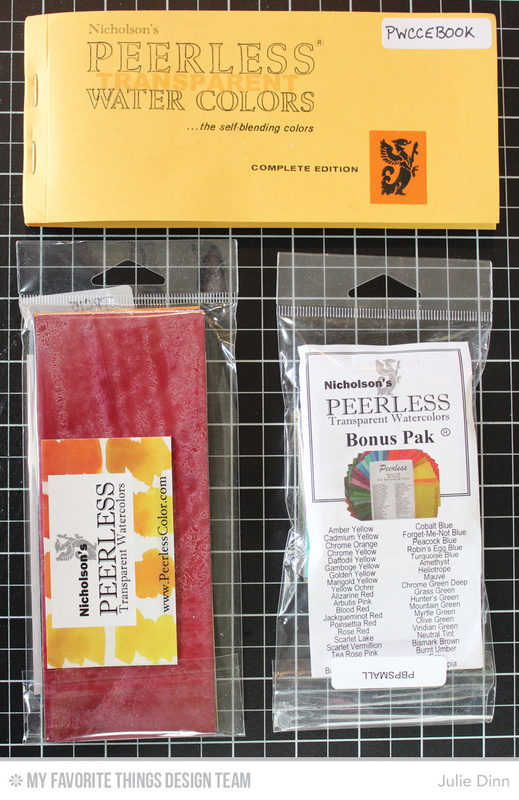 Keep your Peerless the same. I've tried the notebook and it actually takes up a lot of space and a lot of work. I just store all of mine in a little long tin when I went junking one day and it's worked out great for me. If you have a Kirkland's near you or even an old Longaberber cracker basket, that will work great. That's what I do.